I saw this movie when it came out and again a few days ago. I enjoyed it more on the second view. Darkly hilarious. Excellent singing. Can't believe this is a Cohen Brothers movie - whilst often dark, and moody they are usually quirky, interesting, have humor even if black, intellectual and keep your attention - this film was the worst ever - it was depressingly bad - only that we would have disturbed people by leaving the screening we'd have left - Watching paint dry seriously would have been more fun - use the time to do something enjoyable - life is too short. it was a movie that had potential ,but never really went anywhere. 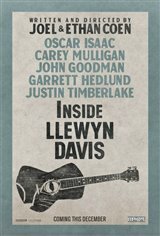 It was a depressing movie about a struggling folk singer who gave up before folk singing became popular.